Cardstock is an important staple for most of us...so today may be a great time for you to stock up! 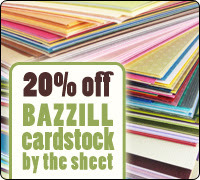 Save 20% on ALL Bazzill Basics Cardstock by the Sheet at Scrapbook.com...today only! This 20% discount in IN ADDITION TO all single sheet quantity pricing (more information available on each product page). Hurry, this offer expires tonight at midnight PST. Shop Bazzill Cardstock by the Sheet!